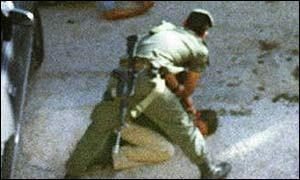 Does a sequence of photographs capture the summary execution of a Palestinian by Israeli police? 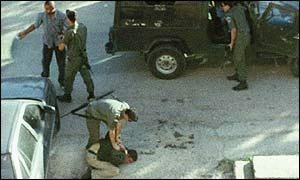 Claim: Sequence of photographs captures the summary execution of a Palestinian by Israeli police. First they arrest Mohammed Saleh, a Palestinian aged 23. So far nothing is wrong with the picture. Please continue . . .
Then they pin him on the floor suspecting he has weapons on him. Still nothing out of the ordinary. They have him on the floor still. 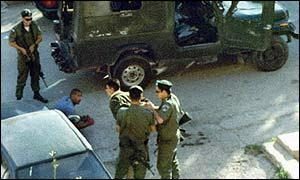 Now they try to question a second Palestinian on the scene. It looks like they have full control over the situation. No problem so far. Now they have to strip him to make sure he isn’t hiding weapons on him. As we can see, he is stripped to his underwear. From what we’ve seen so far, Mohammed has been totally over powered, stripped and pined [sic] down on the floor. He has shown no resistance and there are no signs of any weapon on him. So what would a democratic country such as Israel, a county that claims to respect human rights do? Let Mohammed go? Arrest him? ?